Both teams rallied from being behind on the scoreboard. A new-look Rebels stormed past the Brumbies while a 14-man Highlanders beat the Chiefs in a thrilling start to the Super Rugby season Friday. The Rebels, bolstered by the signing of enigmatic Wallabies outcast Quade Cooper to partner Will Genia in the backs, posted five tries in their 34-27 win in Canberra. The Brumbies’ defeat was made even more painful by superstar David Pocock failing a head injury assessment in the opening five minutes after taking a heavy knock. He was forced from the field, continuing a terrible run of injuries that has seen his off-season interrupted by neck and calf issues. In Hamilton, the Highlanders rallied from behind to narrowly beat the Waikato Chiefs 30-27. All Black half-back Aaron Smith’s late try sealed the win for a team who had Sio Tomkinson sent off for a high shot on Brodie Retallick. The Brumbies took a 22-19 lead into half-time after an entertaining first 40 minutes in which both sides planted three tries. Folau Fainga’a flopped over the line after a powerful Brumbies driving maul to get the first try of the Australian season, before Tom English put the Rebels on the scoreboard three minutes later when he touched down after being lifted in a tackle. Both teams were spreading the ball wide, and the Rebels’ Jack Maddocks scooped up a terrible kick from Irae Simone inside his 22 to score an easy try to put the visitors in front. Matt Phillip got the Rebels’ third of the half with Rory Arnold and Alan Ala’alatoa also touching down to keep the Brumbies in the topsy-turvy match. It was a tighter second-half with the home team playing into a strong breeze, and the Rebels took advantage with Anaru Rangi shrugging off three defenders to score after being set up by a barnstorming run from Maddocks. And the match was sealed when Maddocks scored his second try of the night, latching onto a Billy Meakes kick into the corner. “Really proud of the boys, we worked really hard for that,” said Rebels skipper Dane Haylett-Petty, who singled out Cooper — who booted three conversions and a penalty — for praise. The Highlanders trailed 19-10 at half-time in Friday’s first match, and captain Ben Smith said they had to dig deep for the away win. 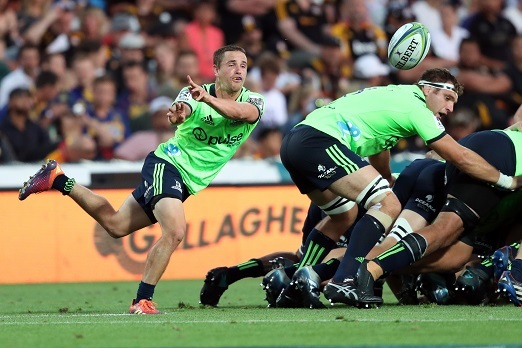 “It was a hell of a battle and what better way to set the tone for Super Rugby,” he said. The Highlanders dominated the early exchanges but solid defence prevented them from making it count until towering lock Pari Pari Parkinson scored the season’s first try in the 14th minute. Kayne Hammington caught the Chiefs’ defence napping with a quick restart that opened the way for Parkinson to burrow his way over the line through a press of bodies. The Chiefs soon hit back when Tyler Ardron broke from the back of a scrum to score. They then took the lead after a spectacular kick and chase from Bailyn Sullivan set up Angus Taavao-Matau for the home side’s second try. Two tries from the Chiefs’ Etene Nanai-Seturo put them on the front foot before a Shannon Frizell score with 20 minutes left kept the Highlanders hopes alive and they continued to press even when they were reduced to 14 men in the 66th minute. Tomkinson was shown a straight red for his shoulder charge on Retallick. Aaron Smith opened the Chiefs defence with a dummy pass to score the decisive try, with the Highlanders holding onto to the ball to see out the final minutes.